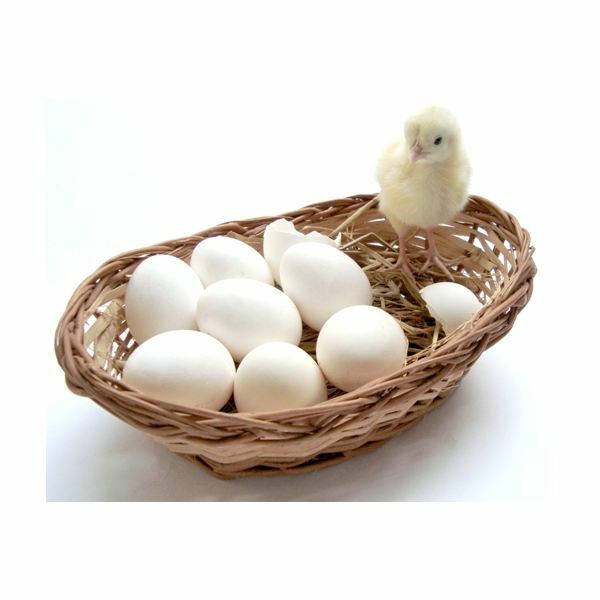 Commercial egg incubators for hatching chicks are expensive, ranging anywhere from $50 for an economy model with no egg turner, on up to several hundred dollars for cabinet incubator models. However, homemade egg incubators not only cost less, but also offer an excellent opportunity to recycle old items like coolers, water heat thermostats, light fixtures and other materials. Naturally, you can let your free range hens hatch their own eggs, but if you want to ensure your replacement hens are from only your best layers, homemade incubators are the way to go! No matter what homemade egg incubator design you use or create, the three things you need to ensure are steady temperature, consistent humidity, and the ability to gently shift or turn the eggs. Temperatures between 99 and 101 degrees are recommended for the highest hatching percentage. Humidity, as measured with a hygrometer, should stay around 85-90 degrees. Hens shift their eggs as much as 90 times a day, but so long as you move them at least three times a day, careful not to jostle them too much, they should be fine. Start by cutting a rectangular opening in the lid of the cooler slightly smaller than the size of your Plexiglas or windowpane. Place the glass over the cooler lid and attach with duct tape. Be sure the glass rests firmly against the lid and all edges are well covered with duct tape. You don’t want to nick your finger on the edge opening or closing the lid and you want a good seal around the window. Drill another small hole a few inches away from the light fixture hole, just big enough for the adapter wire. Drill or cut holes on either long side big enough to accommodate the broom handle. Drill a small hole in the short side, opposite the light fixture to accommodate your hose. Don’t fret if you aren’t overly experienced with electrical work. The plans for these homemade egg incubators are simple and do not require extensive electrical knowledge or abilities. Cut the device end off your old adapter (the part that plugs into whatever device it was originally intended for) and strip approximately 3 inches. You should have a red wire and a mixed color wire. Feed the wires through the small side hole. Using wire nuts and electrical tape, match the wires to your PC fan, red-to-red, mixed to mixed. Secure the fan to the side of your cooler with double-sided tape. Feed your light kit through the large side hole. Cut off approximately 4-6 inches of the wire included with your light kit and set aside one piece. Strip approximately 1 inch of each wire end. You should have one ribbed wire and one non-ribbed wire. Connect the ribbed wire to the silver screw on the side of the light fixture. Use your cut wire piece to connect the brass screw on the other side of the light fixture to the #2 screw on your water heater thermostat. Attach the non-ribbed wire directly to the #1 screw on your thermostat. Mount and secure the light fixture, making sure the openings are well sealed. For safety, ensure the light bulb is not touching the bottom of the cooler. Place your water dish in the bottom of the cooler. Keep it far enough away from the light bulb so it does not evaporate too quickly. Insert hose through side hole and rest in the water dish. Seal the hole in the cooler with caulking to keep cold air out and the hose secure in the water dish. Leave enough hose outside the cooler to insert a funnel to refill water as needed, without opening lid. Cut hardware cloth to fit the bottom of the cooler, above the light fixture. Use gloves, as hardware cloth is sharp and cuts easily. Place thermostat on top of the hardware cloth shelf, close to the light fixture. Place the thermometer on the shelf so it is easily viewable from the incubator window. Slide the broom handle through the holes on either long side. If there are excessive gaps around the handle, partially fill them with caulking. Keep in mind, however, you want to be able to turn the broom handle. Using zip ties, attach a basket to either side of the broom handle and tighten. You should be able to slowly turn the baskets 45 degrees in either direction without hitting the hardware cloth shelf. Plug everything in to make sure it all works. Do not leave fan running, except to circulate air or bring down incubator temperature. Leave your new homemade incubator light plugged in over night to verify if temperatures will reach the desired 99-101 degree temperature. Be sure all electrical connections are secure and bear wires are covered with electrical tape or housed in wire nuts. Be sure the light bulb does not touch the bottom of the cooler or the wire shelf to prevent melting or the metal shelf getting hot. Place your homemade egg incubator close to electrical outlets so cords are not stretched and the incubator is out of walking paths. Not only will accidentally knocking into your incubator jostle the eggs and potentially lower your hatch rate, but could also potentially cause electrical shorts and other dangers.